It is Friday morning and as part of an academic assignment, I am to visit a little known place of worship in New Delhi. On my way to the Judah Hyam Synagogue, I meet Saleem Khan. Saleem, 35, hails from Bareilly district of Uttar Pradesh and runs an auto rickshaw in the Indian capital to make ends meet. He agrees to take me to my destination on the condition that I pay him Rs 20 more than what the electronic metre installed in his auto rickshaw computes as travelling fare. “I hate the Jews for what they’re doing in Palestine. I once saw internet videos of Palestinian children who had been amputated as a result of bombardments by the Israeli Army,” says Saleem, after learning that I was going to visit a Jewish place of worship. Saleem drops me off at the Taj Mahal Hotel, a few metres away from Judah Hyam Synagogue, the only Jewish house of worship in Delhi. Guarding the synagogue are two Central Reserve Police Force (CRPF) personnel who were posted here following the 26/11 terror attacks on Nariman Point, a Jewish settlement in Mumbai. “Is Ezekiel Isaac Malekar available?” I ask the CRPF personnel. They don’t appear to be familiar with the name and ask me to ring the doorbell at the entrance of the synagogue to check for myself. I thought it rather odd that the security personnel were clueless about the man who has been striving since three decades to prevent the flame of Judaism from extinguishing in Delhi. Located at 2 Humayun Road, the Judah Hyam Synagogue stands right next to the busy Khan Market. The synagogue was built by the Jewish Welfare Association in 1956 on land allocated by the Indian Government. The establishment of a formal building was made possible due to a handsome donation given by Dr Rachael Judah in the memory of her father Dr Judah Hyam, who happened to be a prominent religious scholar. Prior to this, the Jews of Delhi held their prayers in a private residence located in the older part of the city. The synagogue is attached to a Jewish cemetery, which shares its boundaries with two more cemeteries belonging to the Parsi and Christian communities. This in turn makes the place a sort of meeting spot for the micro-minorities of India. Since it is Sabbath day and the Rabbi is busy with preparations for the weekly prayers, he agrees to speak to me for no more than 15 minutes. “We are not orthodox. Men and women have been praying together in this synagogue since 20 years. We don’t believe in gender discrimination,” says Ezekiel Isaac Malekar. Rabbi Malekar is the head of the Jewish community in Delhi. He is a former government servant, having served for 15 years as Deputy Registrar in National Human Rights Commission. He also recited Jewish prayers at the funeral ceremonies of Indian Prime Ministers Indira and Rajiv Gandhi. Malekar has a liberal approach. 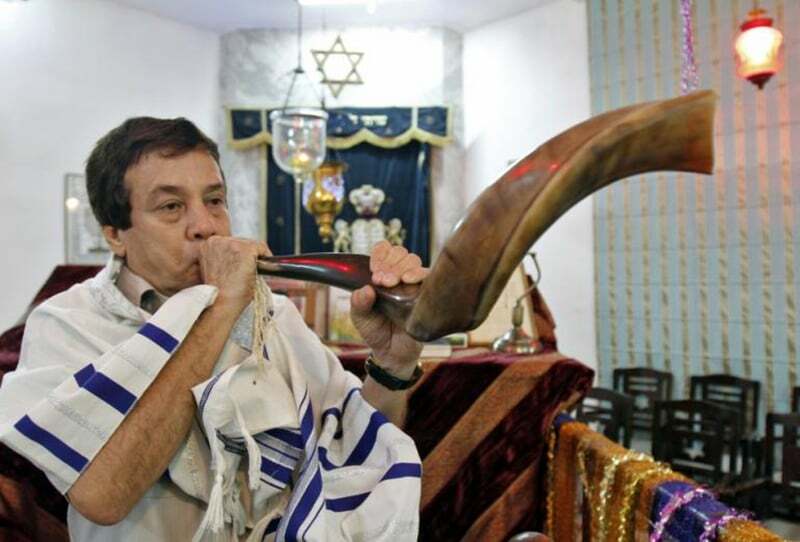 He has conducted several inter-faith marriages but his daughter Shulamith’s wedding to Sharon Pinhas Bhalkar in 2012 was the first Jewish wedding in Delhi in over five decades. Though the synagogue was originally established to cater to the growing needs of the Jewish community, the population of Indian Jews has fallen drastically over the years. Out of a total population of 1.2 billion, there are no more than 5,000 Jews living in India. A large chunk of the Jewish population in India resides in Mumbai, the commercial capital of the country. The city is home to the famous Gate of Mercy Synagogue which was built in 1796 and is alternatively referred to as Juni Masjid. At one point in time, the membership of the Judah Hyam Synagogue was held by 250-300 people but currently, it’s down to just 10 families. However, the place has retained its importance courtesy high profile visits from Israeli diplomats and officials. After the establishment of diplomatic ties between India and Israel, the synagogue had a surprise visitor in 1995 in the form of Israeli politician Shimon Peres. Besides holding prayers regularly on Sabbath days, the synagogue conducts the Jewish rituals of bat and bar mitzvah for girls and boys. “India is a very tolerant nation. The Jews have never faced any persecution in this country. There’s not even a trace of anti-semitism,” says Malekar. Interestingly, Malekar supports the proposition of the Uniform Civil Code, an overarching central law which would do away with personal laws of various religious communities and replace it with a common civil law. “We support the Uniform Civil Code. The Jewish religious laws are anyway not recognised in India. We register our marriages under the Special Marriage Act, 1954,” he says.